It is the composer's own direction for tempo -- "Allegretto---having fun!" and the intermediate level pianist will have a lot of fun playing the syncopated melody over the bouncy left hand accompaniment. 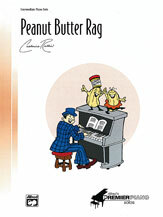 There are contrasts in touch and dynamics, and the constant flavor of ragtime styling. "Peanut Butter Rag by Catherine Rollin is an addictive intermediate-level solo . . . This spirited rag is a delight. Students truly find this piece hard to put down, and I enjoy playing it as much as they do."